Samford University's 10th annual Old Howard 100 bike ride broke a record for the second straight year, with 420 riders taking in the beauty of three central Alabama counties on a sunny Saturday, April 12. "Our rider numbers leaped again this year, even more than we had predicted, and will increase our ability to support Sowing Seeds of Hope's efforts to improve the overall health of Perry County residents," said ride organizer Rosemary Fisk. Riders came from 12 states, including New Hampshire, and the District of Columbia, to take part in the charity ride sponsored by Samford's Howard College of Arts and Sciences, which Fisk serves as associate dean. 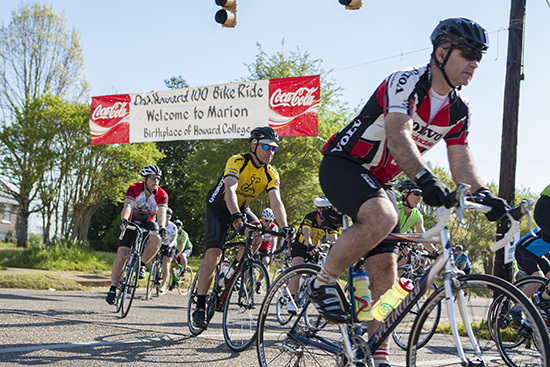 The ride offers routes of 34, 43, 70 and 101 miles through Alabama's historic Black Belt, where Samford was founded as Howard College in Marion, Ala., in 1841. Proceeds that benefit Sowing Seeds of Hope have tallied more than $30,000 during the first nine years of the ride. The amount raised this year will well exceed last year's check to Sowing Seeds of Hope of over $5,600, predicts Fisk. The 2013 ride registered a then-record setting 288 participants. Sowing Seeds of Hope executive director Frances Ford will be grateful. "These funds will be used to provide health care in an area where there is no hospital," Ford told the riders as they gathered at Judson College in Marion to begin the ride. The local cardio-vascular clinic that is staffed by Samford pharmacy students and professors, she said, sees more than 500 patients with varied health care needs each year. "We could not do the work of Sowing Seeds of Hope without the help of this ride and Samford University," said Ford, a Samford nursing graduate. Fisk, a lead organizer of all 10 Old Howard 100 rides, says Saturday's high turnout may be in part because in 2013 the ride joined the Alabama Backroads Century Series. The series of 10 rides seeks to promote the growth and development of long-distance cycling in Alabama. "We fit the intent of the series with its backroads theme," said Fisk, noting that riders bring attention to series events through their posts on Facebook and Twitter. Terrie Hinton of Tuscaloosa, Ala., said she signed on both years because of the Backroads connection. "I am trying to hit most of the rides in that series," Hinton said before setting off on the 43-mile route. Six riders-Ed Carmack, Jonathan Huffman, John Lipsey, Eddie Owens, Jeff Scrimsher and John Voss-can claim 10 straight years of Old Howard rides. Huffman and Lipsey, friends since childhood, say their first Old Howard happened by chance, but now they wouldn't miss it. Huffman, who lives in Alpharetta, Ga., and Lipsey, of Selma, Ala., were looking for a ride to do together 10 years ago, when they decided the Old Howard "looked interesting." "When I realized the Rural Studio was a SAG (support and gear) stop, that sealed the deal," said Huffman, who was a friend of the late architect Samuel Mockbee, founder of Auburn University's design/build program known as the Rural Studio in Newbern, Ala.
"Now, it's a 'have-to-do,' as well as a 'get-to-do,'" Lipsey said of the ride. For the first time this year, the route passed directly in front of his house in a historic Selma neighborhood. Riders included a father-son duo, Jimbo and Griffin Stangel, and Griffin's friend, Terri Hong, all of Madison, Wisc. Nan Peterson, Jimbo's wife and Griffin's mother, was their designated cheerleader. Griffin Stangel, a U.S. Navy pilot stationed at Naval Air Station in Meridian, Miss., and Hong saw the ride as a good preparation for an Iron Man Texas they hope to do in May. "This is a really great course with beautiful countryside and a nice mix of rolling hills and flat areas," said Hong, noting that it felt good to ride outside. "The roads in Wisconsin are still sandy and salty from the winter snow." Peterson liked the temperatures, which reached the high 70s. "After the winter we had, this is a treat," she said. While her riders were traversing the roads of Perry, Hale and Dallas counties, she visited the Alabama Women's Hall of Fame that is housed at Judson and toured the picturesque courthouse square, where she admired the "nice architecture, churches and homes." She was impressed with the overall mission of the ride. "My husband and I are both in healthcare, so knowing that the proceeds support that cause makes it even more special," said Peterson, a nurse and child health advocacy director. Her husband is a pharmacist. A familial riding pair from closer to home was Samford philosophy department chair Dennis Sansom and his son, Jonathan, a 2012 Samford graduate. Riders also included Judson College president and Samford alumnus David Potts and several Judson students, such as Sau Nam. The senior from Burma was on her third Old Howard 100, which last year she turned into a prayer and meditation ride. "I enjoy looking at God's creation. It is so beautiful," said the English and education major who completed the 100-mile route for the third straight year, even though she didn't figure she had trained enough this year. "It has been a really busy senior year." Lue Gene Wright, a local church pastor and Judson security officer, was on his 9th ride. "I just enjoy being around the people and the opportunity to get in shape," said Wright, age 57. That the ride has what Fisk calls "many moving parts" may be an understatement. Dozens of volunteers help with preparation and execution of the ride, which involves strategic placement of rural police officers and volunteer fire departments to ensure the safety of bikers and motorists. Support organizations of long standing include the Pell City Ham Radio team, which was stationed at Judson and at each SAG stop, and included 1984 Samford graduate Phillip L. Johnson, Sr., a retired Birmingham policeman from Springville, Ala. Their duties included relaying requests from riders who needed assistance from the Cahaba Cycle van for flat tire repairs and other emergencies. Repeat Old Howard volunteers Glenn Slye and Eugenia Anderson of Birmingham's Mountain Brook Baptist Church offered hot dogs and lemonade to bikers returning to Judson at mid-day from the shorter routes. The church supports Sowing Seeds of Hope in various ways, such as providing school supplies to students and Thanksgiving dinners to senior citizens, said Slye. Groups of Samford students, most sporting "Samford Gives Back" tee shirts as a nod to the same-day effort that had hundreds of their classmates at service projects around Birmingham, manned the five SAG stops. These included Howard Scholars, Omicron Delta Kappa leadership honor society, Sigma Chi fraternity, Gamma Sigma Sigma service sorority and Alpha Tau Omega fraternity. Samford graduate Stanley Woodall, a retired insurance actuary who now teaches high school math, kept track of registration check-ins and returning riders for the 9th year. "It's just fun to be down here," said Woodall, a member of the Howard College of Arts and Sciences advisory board. The fraternal division of Woodmen of the World financial services company provided American flags to each rider and honored six military veterans with larger "presentation" flags. "This is a way we can give back to the community and show our patriotism," explained WOW representative Chris Kervin. The local Francis Marion High School drum line gave riders a dramatic sendoff to begin the ride at the Judson campus gate. Drum major Raheem Sanders, a sophomore, found it to be a "very new and surprising experience." "It's wonderful to see so many people from different places coming together to do something like this in Perry County," Sanders said.